PKS 0745: From Super to Ultra: Just How Big Can Black Holes Get? Some of the biggest black holes may be even bigger than previously thought. A survey of 18 giant black holes shows that at least ten may weigh between 10 and 40 billion times the mass of the sun. Astronomers have dubbed these "ultramassive" black holes. In addition to the X-rays from Chandra, the new study also uses radio data from the NSF's Karl G. Jansky Very Large Array (JVLA) and the Australia Telescope Compact Array (ATCA) and infrared data from the 2 Micron All-Sky Survey (2MASS). These results were published in the July 2012 issue of The Monthly Notices of the Royal Astronomical Society. 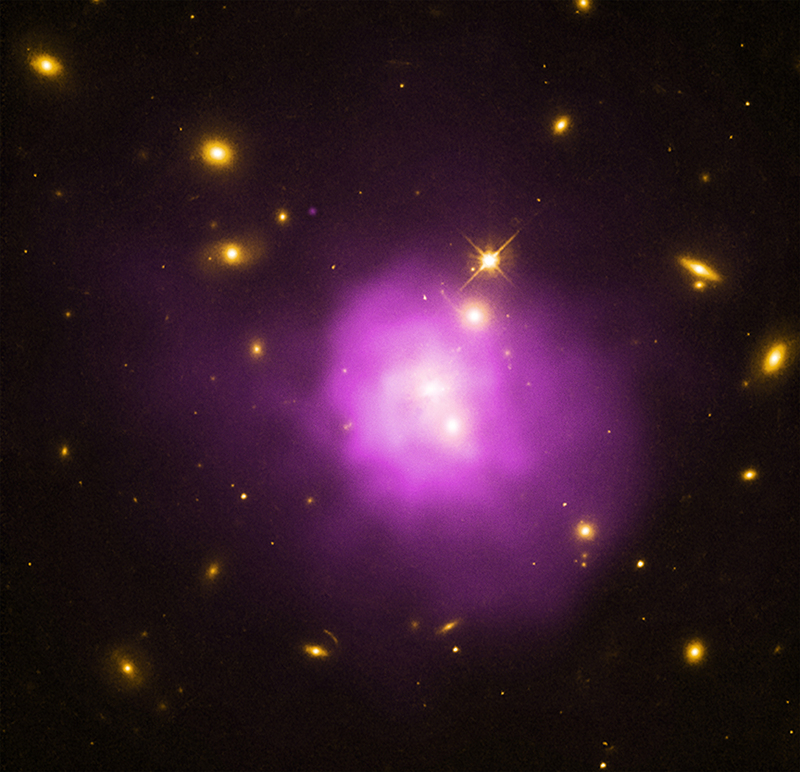 Coordinates (J2000) RA 07h 47m 31.30s | Dec -19° 17´ 40.10"
Just as a curiosity, this question is not related to this picture, have Chandra taken X-rays of IRC 0218? 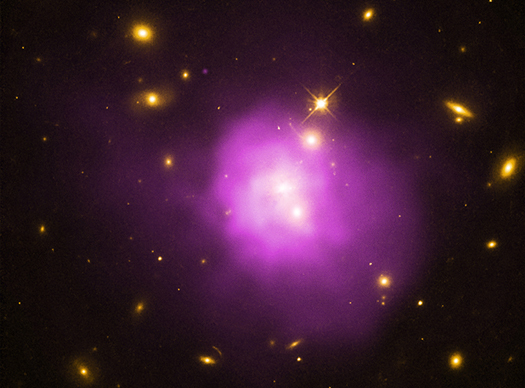 A galaxy cluster about 1.3 billion light years from Earth with a large elliptical galaxy in its center. 1.32 billion light years from Earth. 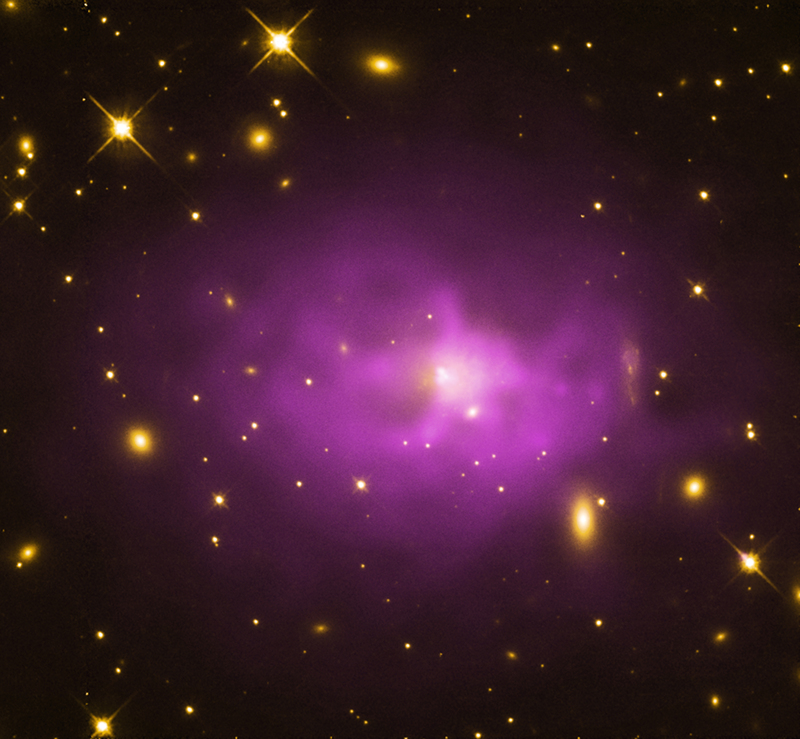 Combining X-ray data from Chandra, optical data from the Hubble Space Telescope and radio data from the NSF's Karl G. Jansky Very Large Array (JVLA). About 511,000 light years across. X-rays are purple, optical yellow and radio blue.